High-tensile lifting point pewag winner profilift eta, for welding onto machine parts or vehicle bodies. Ideal for hanging of lifting and lashing parts. Due to the integrated spring, the ring will be kept in each requested position. 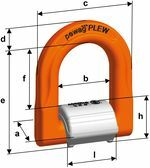 The PLEW has a higher rated capacity than the pewag PLE/N and additionally can be loaded higher in the preferred load direction (see user manual). The grooves on the weld-on bracket at 45° and 60° simplify the recognition of the permitted inclination. The instructions according to DIN EN ISO 14341 are valid for the welding. The welding may only be carried out by a welding operator with a valid qualification according to EN 287-1 or EN ISO 9606-1. The lifting points will be packed individually and together with a user manual and welding instructions. 1) The spring only assists the weld-on process. It does not hold the ring in each position. direction of pull is not in the foreseen area. loading ring rests against edges and load.